The USN Bluelab Whey Protein is scientifically formulated with whey isolate, hydrolysate and concentrate to support muscle development. Our great tasting shake provides you with an impressive 25g of protein per 34g serving. Each serving contains 5.5g of naturally occuring BCAAs. Our easy digesting whey formula contains Tolerase a pH stable lactase enzyme contributing to improved lactose digestion, ideal for those who have difficulty digesting lactose. 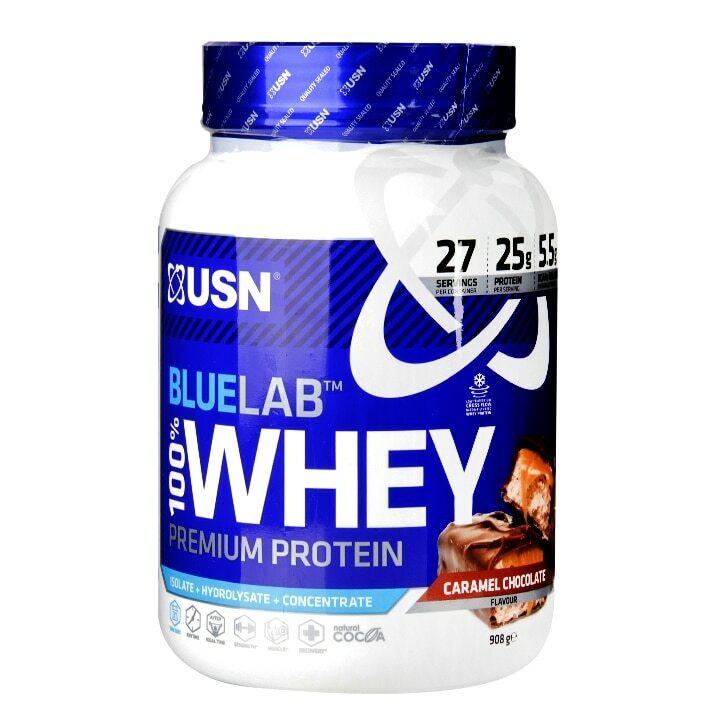 USN Blue Lab 100% Whey Caramel Chocolate is rated 4.8 out of 5 by 12. Rated 5 out of 5 by Hyde from Tastes great Been using with porridge oats for breakfast and after a workout.tastes great! Rated 4 out of 5 by Libby FIPT from Finally found a Whey Protein I like! I bought Carmel Chocolate. This is the first Whey Protein I’ve bought that actually tastes decent. Personally it could be sweeter!